This was my first time to Galveston, Texas; however, I have raced in Texas many times before. 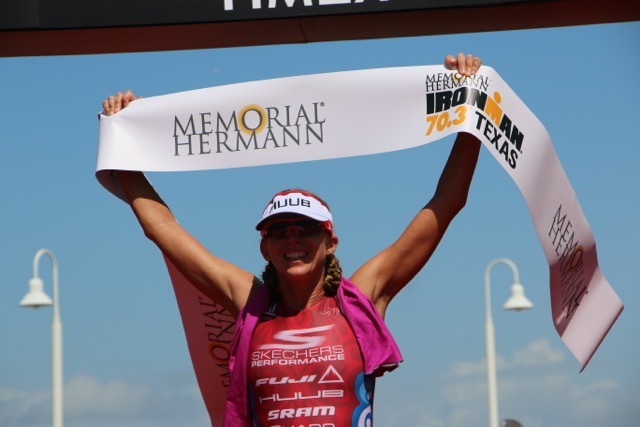 I raced several times in Dallas and in Austin for the Lifetime Fitness Tri’s. I also raced in Houston, El Paso, Waco, Lubbock, and Dallas during my track days at the University of Tulsa. 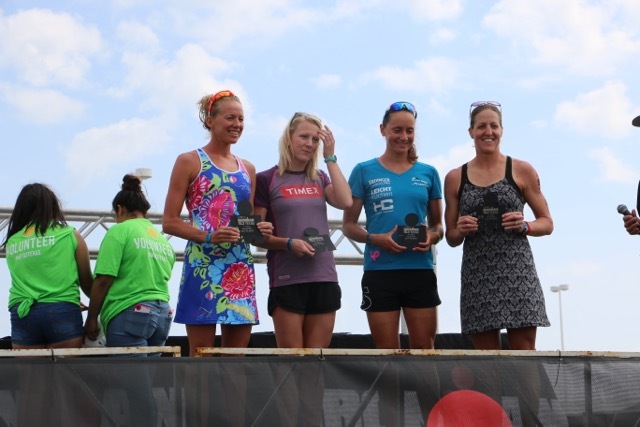 This part of Texas was a bit different since it was on an island and had plenty of wind, surf and sun on race day. This race was a last minute decision after the Puerto Rico race. We figured that my body was healthy and it was a race that was so close to home, so why not? The entire family joined me on this trip, so it made the trip also a family vacation and Caroline had a blast swimming at the heated hotel pool, making friends and also playing at the beach. She cheered for Mom during the running portion of the event, but was pretty wiped by the end and was sleeping when I crossed the line. It is always a great feeling to break the tape in first position and never easy. The week before the race, I caught another cold and ended up not being 100 percent sure if I was going to race. Fortunately, I began to feel much better a couple of days prior to the race and made the call to give it a go. Getting up race morning did not feel as early as the other races, since I was in Central Time Zone (verses my normal Eastern Time Zone), which was nice. I did not feel as nervous as I normally do either, which was nice not to have as much adrenaline pumping through me. Sometimes I think all the adrenaline pumping through you prior to the race is what can also make you even more exhausted after a race! The swim was a one loop wetsuit swim (70 degree water). I used the HUUB Design AXENA wetsuit and the HUUB Design VARGA Goggles. The water was fairly calm, considering how much chop there could have been. The wind was out of the Southeast at 18 miles per hour, but with the wind being in that direction, the water was slightly sheltered. I started off the swim feeling good and kept up a smooth, moderate pace throughout. Fortnately, I did not feel too hot in my wetsuit. I have not worn a wetsuit in that warm of water before, because in short course racing the temperature has to be below 68 degrees. 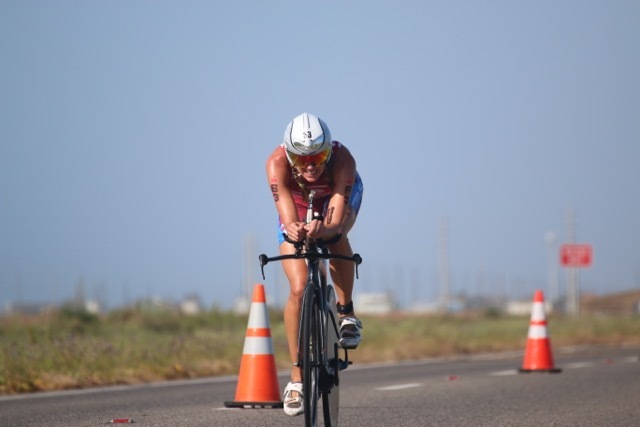 I exited the water with about a 90 second lead and felt good getting onto my bike. Once out on the bike course we had a cross head wind on the way out and so on the way back after the turnaround, we were flying! I had built up to a 2:30 lead by the 15 mile mark and maintained that lead through the halfway point. The bike was very flat and fast, with just an out and back section. But that also made for a very lonely bike. I could not see anyone for most of the ride. With about ten miles to go, I got a split that I had a two minute lead. I must have let up with the tailwind on the way back and when I exited transition I had a 90 second lead. The last ten miles I also had a headache and spit up several times, so I think my nutrition was slightly off. Too much gel and not enough fluids? This is something I will work towards of the next one. The air temperature was about ten degrees cooler than I have raced the 70.3 rides in the past, so that could have been a factor. My Equipment on the bike course was, the Fuji Norcom Straight 1.1 with: Zipp Firecrest 404 tubular with Tangent SLSpeed Tires, Zipp Super-9 Disc Tubular, with Tangent SLSpeed Tires, Quarq Elsa R Power-Meter, SRAM eTap wireless components, ISM PS 1.0 saddle, Zipp Vuka Stealth base bars with ski-tip extensions, Speedfill Z4+ with the A2 Stem Mount, and the A2 system, along with the R3 system. Sampson Stratics Carbon Ti Pedals, and Rudy Project Wing 57 Helmet with Mirrored Visor. I felt pretty good getting going into the run. The run gear for the day was: Skechers GoRun 4’s, Triflare USA Beauty Race Suit, Mission Cooling Towel, Rudy Project Tralyx Glasses, I usually use the first half mile typically pretty chill to get my gel and everything situated. Just under a mile into the run, I had to change gears pretty quickly. Second place had made up ground and was just 1:15 behind me. I began to try to pick up my cadence and try to minimize the time she was gaining. The sun was pretty intense and I still slowed through the aid stations as I knew it would be important to get as much fluid as I could. After one lap, the gap was down to 50 seconds. The course was very twisty and had many turns (inculuding four 180 degree turns per lap). After mile 8, the gap was down to 20 seconds. At mile 9, I heard a split of 25 seconds and that gain back in time gave me a boost knowing I needed to surge. At mile 10, I ended up gaining back one minute and for the last couple of miles, I was able to cruise into the finish. Huge congrats to Jeanni on her race and for pushing me all through the run. This run was very tactical and forced me to stay mentally tough all day. Another half and more lessons learned to use towards the next one. It was great to have support from Nate giving me encouragement and splits throughout the run section of the course. Just a little less than two weeks and I will be toeing the line for the St. Anthony’s Triathlon. Thank you to all my friends/family and sponsors for the support. Very grateful for the opportunity to achieve a win.